This was the last organised ride of 2008, and brought to a close the Sunday ride-out programme of what is generally agreed to have been the wettest summer ‘since records began’. Happening the same weekend as the Lobster Run (where seafood rules the roost) and a couple of weeks before La Garda’s joint challenges to wallet and endurance, it was as late in the season as Chapter Director John Warr was prepared to risk this year. His insistence last December on shortening the ride-out calendar for 2008 may have been based on rare prescience - who can forget April’s untimely snow or Augusts’ apparently ceaseless downpours? A digression in respect of the Chapter Director. You can read elsewhere the history of Chelsea and Fulham HOG Chapter, and the history of our sister chapter Meridian is known to us all. I have been a member of Chelsea & Fulham since 2000 and have taken part in over 50 ride-outs and weekend trips. None of it would have been possible without the continued and valued support of John Warr, an indefatigable rider as well as consummate host. We thank you. Peter ‘Scottie’ Scott and I recce’d the route about ten days before the ride, and then Scottie did some refining and adjustment to avoid the worst of the gravel and the run-offs from the fields (yes, really, it could have been much worse). On the recce the rain was so bad that we actually stopped under an overhanging tree on the M4 just past the elevated section for a while until visibility improved from 15 yards. The timing was thrown so far out from the proposed schedule by the incredible weather that we had lunch near the coffee stop! The road was at times marked only by the apparent river running between hedgerows standing proud from the deluges of water and alluvium. It wasn’t so bad for Scottie ‘cos he was borrowing a bike whilst his own 90,000 mile softail had the rear suspension renovated with a gas axe (Warr’s had apparently run out of hand grenades) but I was riding my own bike and it got FILTHY. Still we discovered two important things - if the weather was going to be any good this would be an awesome ride, and the destination pub did indeed serve excellent food and drink. No, make that three; this year’s Fat Boy is a sweet motorcycle and runs under water! Roll forwards to the day itself. We have had occasional trouble with drop-offs this year. The briefing was detailed, precise and directed. No trouble ensued. The gathering throng contained many welcomed faces, the usual mix of new and old. It was good to see Gavin and Janet fully recovered from their recent spills. The memory of a sodden Minehead may take years to dissipate completely. JW was there to welcome us, provide breakfast and wish God-speed. The day was indeed beautiful. Scottie led, I was last man. We passed numerous landmarks of previous rides as well as exploring pastures new. Burnham Beeches will repay future visits. The worst of the gravel and mud had gone from the roads, and nary a false turn was made. The coffee-stop pub remembered at the last moment that we were turning up and fortuitously made a good few quid for their minimal trouble. And we all arrived at the Crazy Bear pretty much on schedule and in time to meet H-D Europe’s Marj and friends over from Chicago for an impromptu 105th Anniversary re-union. The food was, indeed, awesome. And then we went home... for another year. Fret ye not, the Road Captains are meeting soon to decide next year’s programme. It will include a variety of day trips as well as the ever popular continental jaunts (let’s hope the pound recovers against the Euro). 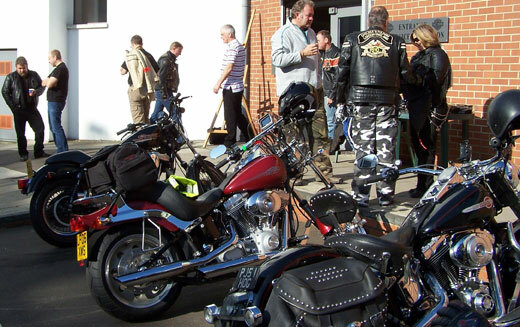 New for 2009 will be the Benelux HOG Rally on 5th to 7th June, following immediately from the legendary Meridian HOG’s Legs on 4th June; Bisley will be in August, St Tropez in May. There’ll be a battlefield trip mixed in there somewhere as well. Don’t forget also to check the Meridian events list, as members of both Chapters are equally welcome on each others’ ride-outs, and starting from Mottingham (or the meridian line at Greenwich if we are lucky) gives the ride a different vibe. Ride safe and see you for Breakfast at Smiths in December.